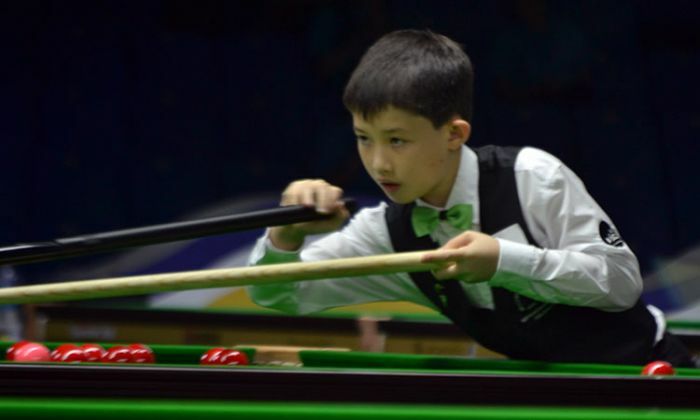 The youngest participant of this year’s World Under-18 Snooker Championship is from New Zealand. The 9-year-old Riley James has already started leaving his footprints in the world of snooker. His striking and approach towards the match already being praised by many from snooker world present here in China. Though he hasn’t won any match so far but today he countered his Iranian opponent very well. He got one frame advantage because of late appearance by Sami Tousinezhad. Later he went down in next two frames to trail 1-2 but he pulled up the fourth frame very well to set decider and gave a close fight there too to Sami before losing against him 2-3. Riley is Class 5 student and lives at Wellington in New Zealand. His current national junior snooker standing in New Zealand is Rank-3. In another match, Chinese player Yi Song Peng outclassed Austrian No.1 and World No.3 Florian Nuβle in straight set of frames 3-0. Florian had slight chance in first frame where he scored 43 points but Yi Song made 50 points break of take 1-0 lead. After that Yi Song dominated the match and made breaks of 80 and 106 in subsequent frames to close the proceedings 3-nil.